If you’re looking for a cultured city break on the cheap, Madrid is home to some of the chicest hostels and budget accommodation in Europe. Forget crowded dorms and queues for the bathroom, many Madrid youth hostels have the choice of private rooms and ensuite bathrooms, and come with extras like free breakfasts and city tours. Hostels are the ideal choice for any cash-strapped traveler - from your city center hostel, Madrid is easy to explore on foot, saving you money on transport, and with the choice of self-catering facilities and kitchens, you can cut your food budget in half. Feeling inspired? 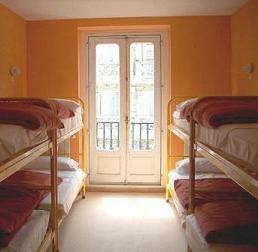 Here is a selection of the best Madrid hostels. One of the top rated youth hostels in Madrid, the One Puerta del Sol is the perfect introduction to the city - only one block away from the main square, it lies on a street surrounded by traditional Tapas bars. Recently refurbished, this small and friendly family-run hostel is clean and modern, with a cosy kitchen area for preparing and enjoying meals, and a lounge complete with TV, DVD player and a library of guide books for relaxing after a hard day’s sightseeing, or planning your next adventure! A hip boutique hostel and apartment complex, Stadmadrid is in the trendy district of Chueca-Malasaña, within walking distance of the city’s best nightlife. This elegant old building has been given a slick makeover, with modern and funky furniture, chic minimalist décor and free wireless in the rooms. There’s also a travel desk which organizes tours, and gives out handy travel tips and advice. This Backpacker’s hostel caters to a fun-loving crowd, with organised parties and pub-crawls, and is open 24-hours with no curfew – leaving you free to enjoy Madrid’s legendary nightlife! The dorms and private rooms are perfect for chilling-out post-party –all are brightly coloured, well-ventilated and have individual private lockers for stashing your stuff. The hostel has a whole host of free extras such as linen and a luggage room, but the free continental breakfast is the perfect antidote to the night before! Consistently voted one of the best youth hostels in Madrid, the Albergue is ultra-modern, with a futuristic design and top-class facilities – the hostel has its own lounge, dining room, games room and even an exercise room and gym with bikes! Rooms sleep 4-6 people and come fully equipped with personal night-lights, lockers and a key-card entry system – some are also wheelchair accessible. This hostel is perfect for large groups of friends and younger travelers, as guests over 25 have to pay an extra fee.